I recently came across the Peggy Collection during last year when, I was browsing for knitwear garments. However the collection only came to my mind when I was shopping for my outfits for spring and summer. The Peggy Collection has grown upon me ever since I thought about wearing one of the garments, to London Fashion Week Autumn and winter 2012 season. Since then I have been in contact with the head designer and founder of the Peggy collection and during my first week of my spring break before heading to Edinburgh, I managed to have an interview with Diana about her collection, inspiration behind the collections, and any other future goals she has for the label. Take it away Diana! How did you come about setting up the Peggy Collection? Peggy's collection started as a business idea when I realised I was designing and making items that people loved to own and wear and it works around my family life too. Although I never really leave my work as I always have something to so but this is also a blessing as it fits in around my children too. What inspiration do you use when creating the garments? My main inspiration was my late grandmother Peggy who taught me to how to knit. I get inspiration also from magazines, vintage patterns, colours lots of different areas really. When did you develop your first garment for the collection? For this spring summer collection my first garment was the mans vintage inspired waistcoat containing Fair Isle. My very first garment that really made my name was the chunky knit scarf that I made for Gok Wan. During your career of selling and creating knitwear and ready to wear garments, have you achieved any awards? 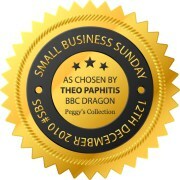 I received the award of #SBS winner from Theo paphitis of dragons den which I was so thrilled to receive and I am meeting the man himself this month in Norwich. I also won inaugural uk start up award on twitter I was also featured in world of wools designer profile on their website and on their calendar last year. 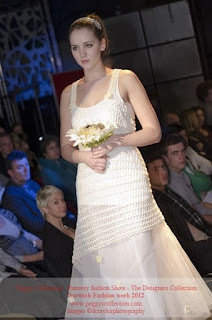 What is like seeing your collection on the runway at Norwich Fashion Week? It was a very magical experience. It was such an honour to be part of the fashion week considering it is my local one too. It was the best feeling ever to see my logo as my designs came down the catwalk. Finally to end have you got any future goals for the Peggy Collection? I aim to be stocked in some boutiques around the country. I have had two confirm they would like to stock some of my items so it's a good start. I am also going to be designing some more knitting patterns to be for sale too. * Images are credited with photographer who has taken them. I have been given permission to use these pictures for the post by the person who owns them.